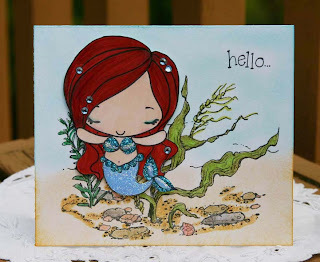 Today's Featured Stamper over on SCS is Roxie Glaza, her work is really beautiful and she provides us with fun sketch challenges every Wednesday!! This card is a case of one of hers from her lovely gallery. I used Cardstock: Perfect Plum, Basic Black, Whisper White. 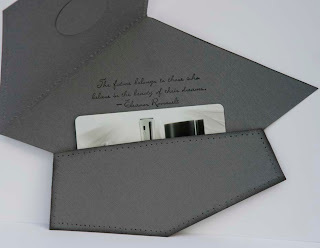 The designer paper is Basic Grey Euphoria. I sponged the edges in Bashful Blue, Plum and Sage Shadow on the bottom. Stamped Kindred Spirits in black and Garden Silhouettes in Basic Gray ink. For the circle image I masked off a small circle and sponed on some Basic and Going Gray inks. Stamped silhouette flowers in black. Butterfly is from the hostess God's Beauty set colored in markers. 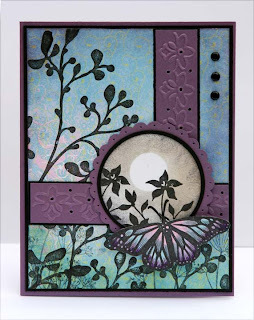 For the Perfect Plum strips I used the Cuttlebug borders embossing folder and matted it in black. Black brads for side embellishing. 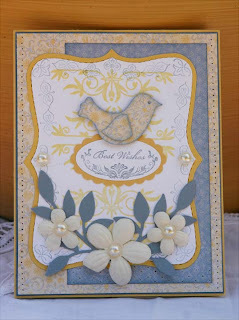 This card uses the Bella Birds paper with Bordering Blue and So Saffron cardstock. I stamped the images from Frames With a Flourish in Saffron and the smaller border ones are fram Fancy Flexible Phrases onto the Top Note die cut. I used the bird from Birds and Blooms Sizzlits in matching paper. Leaves in Bordering Blue from Sizzlits Little Leaves, prima flowers and pearls from my supplies. Oval All used for sentiment with oval scallop punch in Saffron. I found these amazingly beautiful hand crocheted flowers made in the 1940's on ebay. The detail on this is unbelievable with multiple layers on each petal. 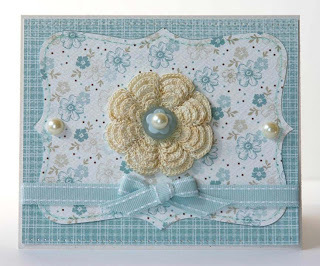 For today's Limited Supply Challenge I used only one sheet of plain cardstock as my card base (Naturals White) with Parisian Breeze designer paper, Top Note die, Pretties Kit pearls, Button Boquet, and Soft Sky stitched ribbon. The blue plaid border around the flowery Top Note is just the negative part of the paper that was cut out (the reverse side of the floral). I never throw anything away! Maker of this stamp unknown, it is an unmounted one. I stamped it with Versamark and then embossed it in gold. 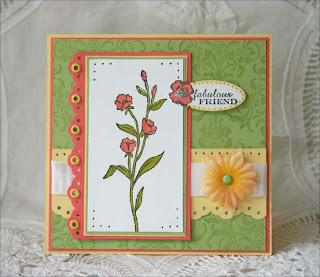 Colored image using an aquapainter and re-inkers of Blush Blossom and Cameo Coral and Old Olive for leaves. 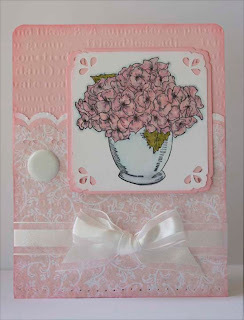 Stamped Birtday Wishes in Coral (Sincere Salutations set), embossed over entire design in clear using Bella Toile background stamp. 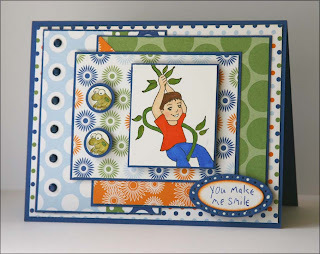 This fun set is called Boys Will Be Boys and is available from Artful INKables. 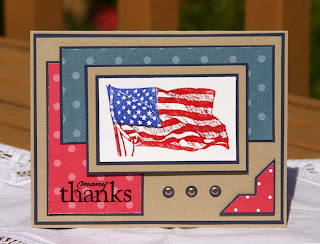 I used Stampin' Up's retired Jersey Shore designer paper with Brilliant Blue base. The sketch is from today's SCS challenge. The frog buttons are made from small circle punches with the acrylic bubble from the Build a Brad set. Image colored with Copic markers. 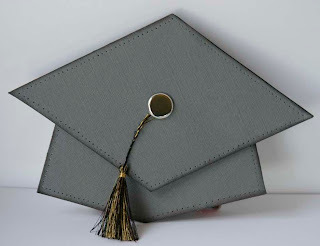 This week our Creative Belli Challenge is to make a graduation card. If you think you don't have any graduation stamps, put on your thinking cap and see what you can create without one. 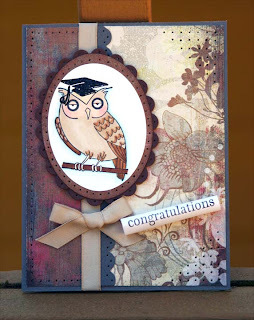 I used my Inkadinkado owl, colored in markers and an Inkadinkado grad cap from an all occasion set embossed in black. You could just use an owl if you have one with the diploma in his claws. For mine I just stamped Congratulations on a piece of paper and rolled it up. 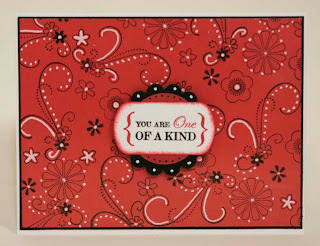 The paper is Scarlet's Letter by Basic Grey with Basic Gray cardstock and taffeta ribbon by Stampin' Up. 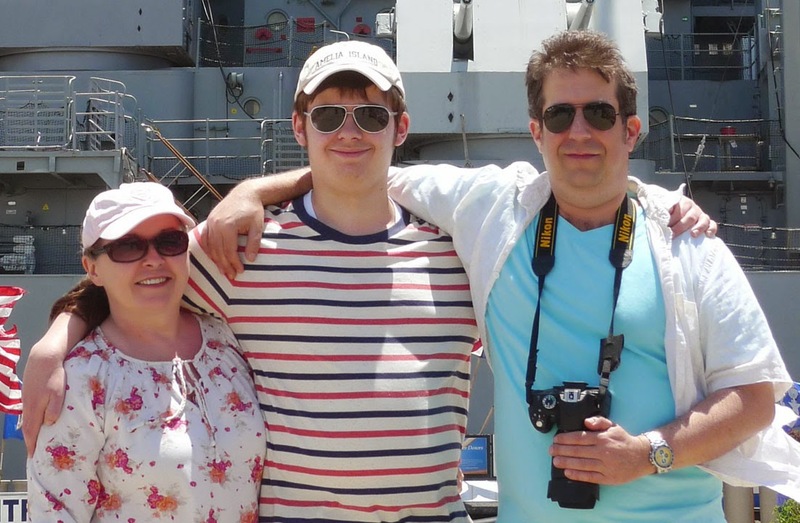 Hope you can join us on this challenge, we would love to see what you create! For my second sample I used Basic Gray textured cardstock and the template from Splitcoaststampers (found in Templates section under Graduation gift Card Holder. I sponged the edges with matching ink and pierced all the way around. 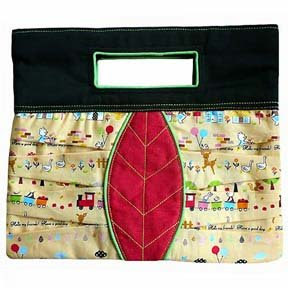 A large brad and tassel were added and the sentiment on the inside is from the retired set Measure Of A Life. It says "The future belongs to those who believe in the beauty of their dreams". by Eleanor Roosevelt. A gift card tucks into inside front. Color combination of So Saffron, Pumpkin Pie, and Bashful Blue. 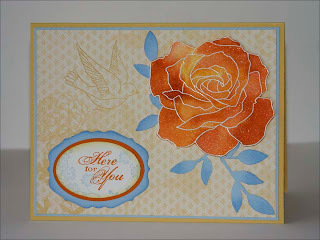 Paper is Bella Birds, Flower from Fifth Avenue Floral on Shimmer White with pumpkin, banana, and apricot re-inkers. Sizzlits Little Leaves in Bashful Blue. I used the sentiment Here For You from Friends 24-7 with the Sizzlits Lots Of Tags die (love it!!). 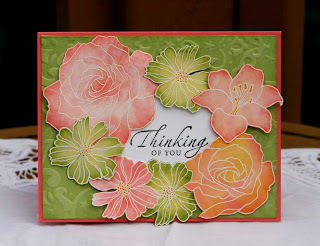 I used the Bloomin' Beautiful set along with Bella Birds paper and Pink Pirouette cardstock. White organza ribbon and jumbo brads in white as embellishments. Inside sentiment from Happy Harmony, I stamped the blossom definition repeatedly in pink for a background, stamped the poppy and colored it with markers. The edges wer made with the Martha Stewart border punch. I ran the Pirouette Pink through the Big Shot using the Friends wording texture plate and the Bella Birds paper through using the polka dots plate. Sponged around all edges with Pretty In Pink. 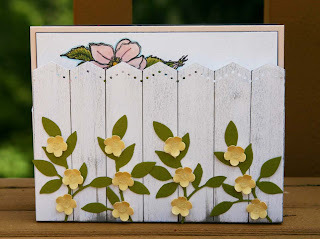 There is a great tutorial on Splitcoast for making this hinge card. It is really very easy and nothing to be afraid of. After making your first one, I think you'll be hooked! A heartfelt thank you to our military and to those who have sacrificed so much to defend our freedom. You are all in my prayers today and every day, may God bless you always. For today's Inspiration I chose the Little Odd Forest handbag found in the first picture. 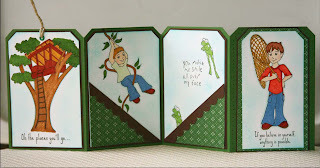 I made a stair step fold card with Old Olive and the SAB designer paper. Embossed the Right On Track wheel in black and trains were cut out (Real Red, Summer Sun, Night Of Navy, and Handsome Hunter). Tree and sentiment are from Loads of Love Accessories. Sunshine from small circle and three flower (retired) punch. Measurements for card are 4 1/4" x 10 1/2", score at 1 1/4", 2 1/2", 4 1/4", 6", and 8 1/4". Background of the stair step card using the scallop was an idea from my demo swapping buddy Patty B. Thanks Patty! 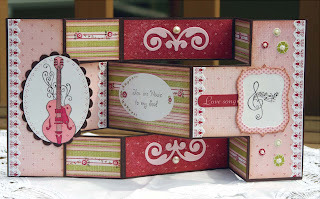 New this week from Artful INKables this set is called Music a la Carte. 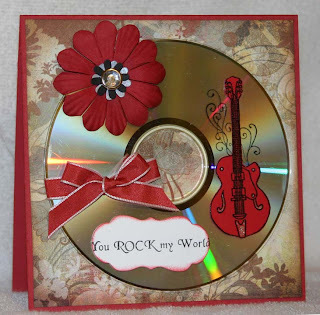 I thought the guitar would be perfect on a CD for today's circle challenge. Basic Grey Scarlet's Letter paper with Making Memories flower and SU taffeta ribbon. Riding Hood Red card base. Guitar was stamped onto CD using black StazOn and then I embossed another one with black embossing powder on Real Red and cut out. 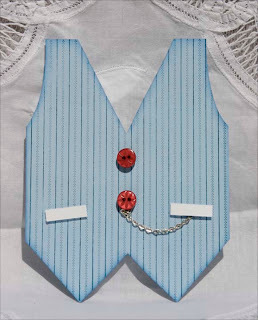 I was inspired by the vest I saw in the latest Oriental Trading Company catalog. 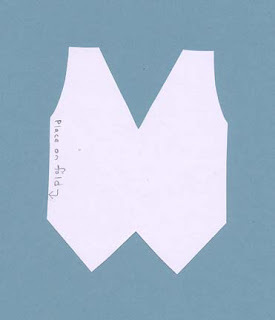 I drew the vest pattern and cut from Bashful Blue cardstock. Stamped Simple Stripes in Not Quite Navy. Added Button Bouquet and silver chain as embellishments. This set will be available in the upcoming catalog and is called On A Pedestal. I double embossed the hand stamped background using a positive and negative impression of the polka dots embossing plates. 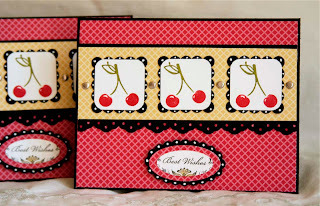 The cherry from the set was stamped in red and I used the little puffy cloud from the Occasions mini train set in pink to create the background on Whisper White cardstock. 1 1/4" Pink Pirouette and 1/4" Real Red grosgrain ribbon, Crystal Effects glaze on cherry, Cocoa icing highlighted with some Dazzling Diamonds. I added some clusters of Pretty In Pink dots all around the edges of the main image to create a frame. This is a yummy set that I think you are going to love. I'll have some more samples to show you within the next few days. 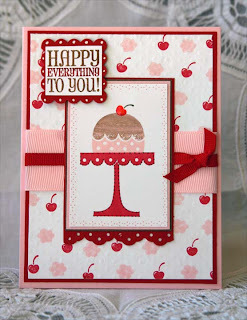 Sweet Nothings Simply Scrappin' Kit from Stampin' Up with a Chocolate Chip card base. I think this is one of my favorites ever of SU's kits. I like all of the papers and the stick ons, they're just my style and pretty easy to coordinate. Embossed Forever Friends wheel in Chocolate Craft and clear powder, sentiment from All Holidays. I colored the flowers in with Ruby Red and Olive markers. The flower is from the Pretties Kit with some of the stick ons from the kit and the Button Bouquet buttons for flower center with a bit of linen thread. The happy birthday is from the All Holidays set. I really love this new set from Artful INKables called Boys Will Be Boys. I colored the image with Copic markers and used today's colors of Only Orange, Purely Pomegranate, and Brilliant Blue. Copic markers were: YR09 Chinese Orange, R39 Garnet,R11 Pale Cherry Pink, E21 Baby Skin Pink, B29 Ultramarine, BG10 Cool Shadow, YR24 Pale Sepia, E37 Sepia. Hodgepodge Hardware Antique Copper and mini butterfly punches for embellishing. 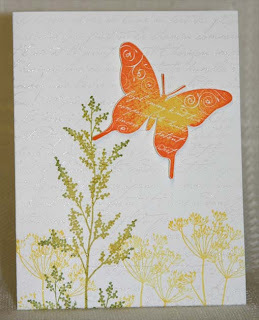 I ran the orange cardstock through an inked Sizzix texture embossing folder. Simply brayer on the matching ink the same as the cardstock you are using before running it through the Big Shot. It gives it a bit more definition. 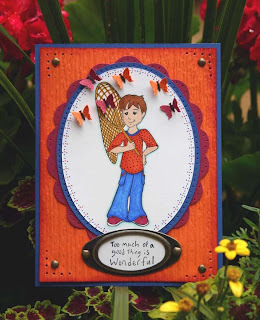 Blog Hop Today at Artful INKables! 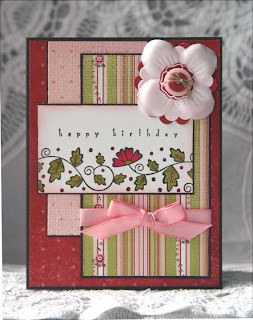 My first card uses the beautiful and elegant set of 11 stamps called Music a la Carte. 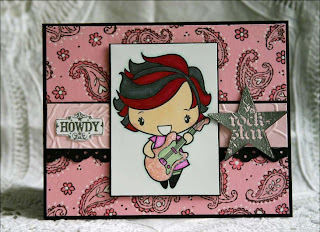 This includes 5 music images and 6 sentiments. I love it!! 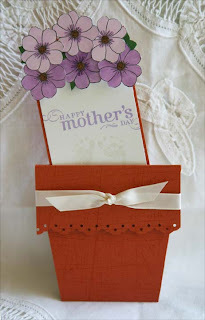 I used my SU Simply Scrappin' Kit Sweet Nothings with some Chocolate Chip cardstock. My second card uses the Boys Will Be Boys set and I can't wait to also use it for some of my scrapbook pages. I made an accordion tag gift card holder and colored all of the images in with Copic markers. The center is a pocket where you can slide in cash or a gift card. Having a boy myself, this is a set I have been waiting for! 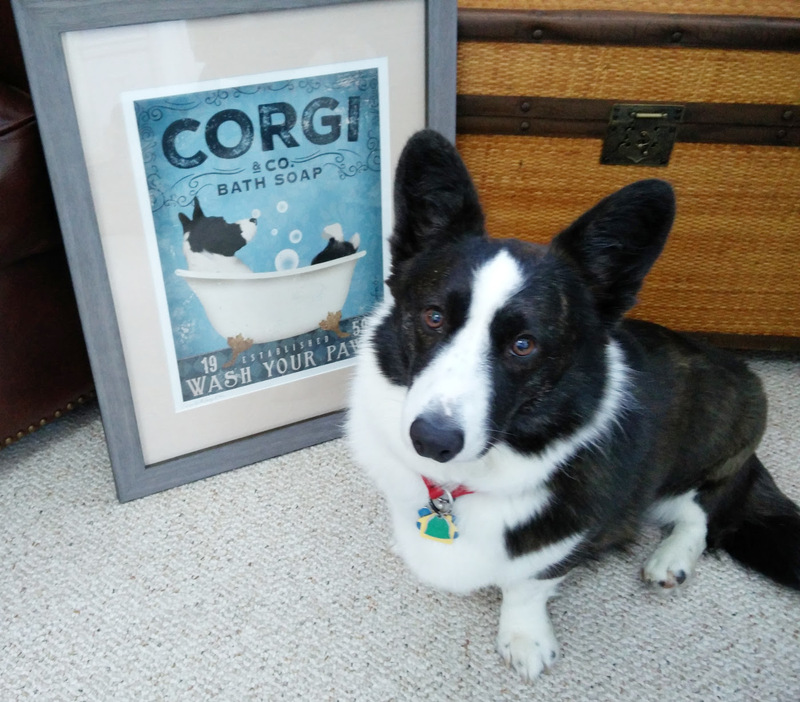 Please continue on the fun blog hop and see what our next design team member has for you at Dawn Lusk's wonderful blog. I scored big time at Joann's today. I got a set of Sizzix Texture plates (a double sided 3 pack) and it came with the extra crease pad and silicone mat all for $7.97. Woo!!!! I inked the plate with Real Red and then ran it through the Big Shot. It slipped while it was going through and I like the way the mistake came out. Kind of 60's looking. 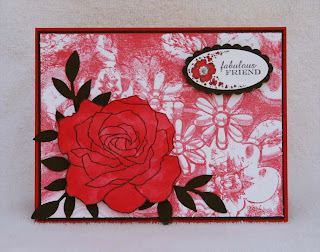 Fifth Avenue Floral rose was embossed with black powder on Whisper White and colored with aquapainter and real red ink. Oval All sentiment with new scallop oval punch for sentiment and Sizzlits Little Leaves in Basic Black behind popped up rose. Tonight (Friday) and tomorrow are Virtual Stamping on SCS and the theme is Vegas. For the first challenge- Double Down- you were to make two cards with either a food or drink, relaxing, vacation, gambling, etc. theme. I thought of cherries coming up on the slot machines! I used Tart & Tangy and the Oval All sets from SU along with the Game Night designer series paper. Greeting Farm Mermaid Anya colored in Copic markers and added SU glitter. Background seascape stamp is by Visual Image Printery colored in Prismacolor pencils. This is also for our weekly Doubledog Dare Challenge this week hosted by Francie G. to use water in our image. 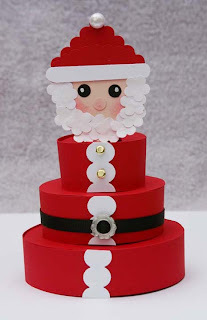 I used Real Red cardstock for the body and added some Whisper White that I edged with the scallop edge punch, the head was a 1 3/4" circle in Blush Blossom, nose and eyes from a standard hole punch, beard three flower punch, hat is scallop square and oval combined. Black 3/8" grosgrain ribbon with Silver Hodgepodge Hardware ribbon slide.Gold brads used for buttons. CBC #65 Belli Color Challenge- Join in! This week our Creative Belli Challenge is to use the Stampin' Up colors of Apricot Appeal, Cameo Coral, and Certainly Celery. I hope you can join us, you can always use the closest thing that you have to this combination. For my card I started with a Cameo Coral base. The next layer is Certainly Celery run through the Big Shot with the new SU Texturz plate "Damask", I sponged some additional celery ink on the edges. 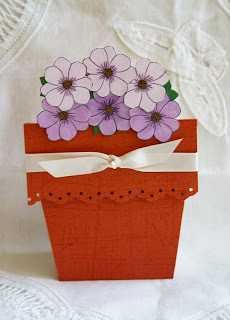 For the flowers I embossed them using Versamark and white embossing powder. Stamp set is Fifth Avenue Floral. I used my re-inkers and an aquapainter to color and added additional color by sponging around edges. The sentiment is from Sincere Salutations on Whisper White. Arranged the flowers around this white oval, some were raised up a bit on dimensionals. For the rock and roll technique, start with your lighter color and ink the stamp completely. Take your darker color and just roll the stamp around the edge, picking up the darker color. You can ink in a little bit farther in for more color or just on the very edge. Experiment and see which you like, both ways are very pretty. I used Summer Sun and Only Orange for the butterfly, Kiwi Kiss and Old Olive for the sprigs, Summer Sun for the smaller ones. I embossed the retired French Script background almost as an afterthought. I noticed similar script in the butterfly image and carried that over to the background. Today's featured technique on SCS is really an easy one, all you need is a white gel pen. 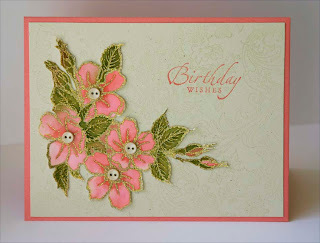 For the first card I used the retired Pretty Paisley background stamped on Pretty In Pink. Highlighted with white gel pen and pink marker. Anya rock star image was colored in Copic markers, added Dazzling Diamonds to guitar. A Little Somethin' sentiments were embossed in silver. The red, black and white card was one I had done earlier in the year. I used a glossy white cardstock, stamped random images using black StazOn and then brayered in Real Red before adding my gel pen highlights. You can use just about any stamped image for this technique which is one of the things I like about it. This is for my niece's first Mother's Day. She is just the cutest little new mama, it really warms my heart to see her with that sweet little baby. This is a combination of a few challenges today, the first is the sketch layout from SCS, I made this a 4 1/4" square card. The second is our Creative Belli Challenge to use the colors of Apricot Appeal, Certainly Celery, and Cameo Coral. Please feel free to join in and substitute similar colors if you don't have these exactly, it a pretty combo for this time of year. The third challenge was for our Doubledog Dare Challenge (DDC) to use lots of flowers and a little bit of sparkle. I started by stamping the brocade image in Celery on matching cardstock. The image was stamped in StazOn black and colored in with Copic markers R22 Light Prawn, YG03 Yello Green, and YG95 Pale Olive. This was mounted to the Saffron and Coral panel that was edged using the SU eyelet border punch. Added some saffron eyelets to this edge. Sentiment is from Occasions mini called Oval All, I cut out a flower from this image and added some Dazzling Diamonds. White satin ribbon is from the mini also. Silk flower is from my stash. 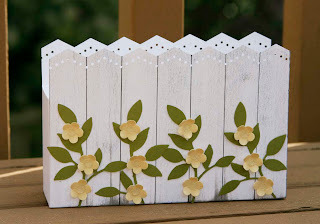 This was a super simple project I made using the Martha Stewart Embossed ZigZag punch and white cardstock. For the wood grain I swiped my Bashful Blue and Going Gray ink pads down the front and added lines with a black Stampin' Write marker. Leaves are in Old Olive (SU Embosslits Little Leaves), Three Flower Punch in Banana with clear microbeads in centers. Cardstock measurement for box is 5 3/4" x 11". Score at 4 3/4 and 6 1/4". Cut a strip to run lengthwise and adhere to box bottom and side with some added tabs. This box is perfect for holding A2 size cards or whatever else you can fit in there! 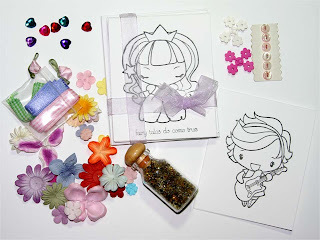 This is a kit I made up as a gift for a young girl who has expressed an interest in cardmaking. I made up a pack of 8 cards for her to color and decorate. Also included in her kit are matching envelopes, ribbons, glitter stars in a jar, rhinestones, buttons, and Primas. The card size is 4" x 3 1/4". This blossom stamp is an unmounted one and I can't find the packaging to tell you who the maker is. When I find it, I'll come back and edit the info. I colored this in Copic markers using R11 Pale Cherry Pink, RV21 Light Pink, R20 Blush and B00 Blue Frost (must haves), YG95 Pale Olive, YG67 Moss, Y17 Golden Yellow, and YR24 Pale Sepia. 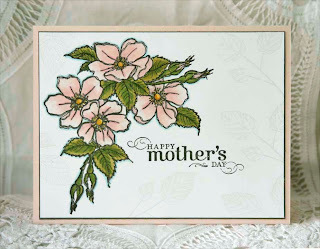 I embossed the leaves from the Stampin' Up hostess set God's Beauty using Versamark and clear powder. I've been doing this a lot lately, it gives the card a bit of texture while still keeping it flat and mailable. This card is on it's way to NJ for my husband's Nana. Sentiment is from SU's All Holidays stamped in black. 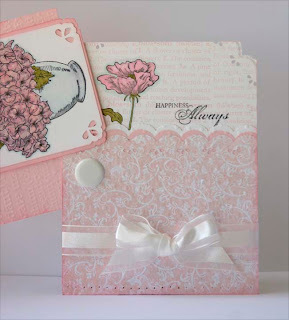 Cardstocks used were Whisper White, Basic Gray, and Blush Blossom. Hope you all have a wonderful weekend. Happy Friday! !